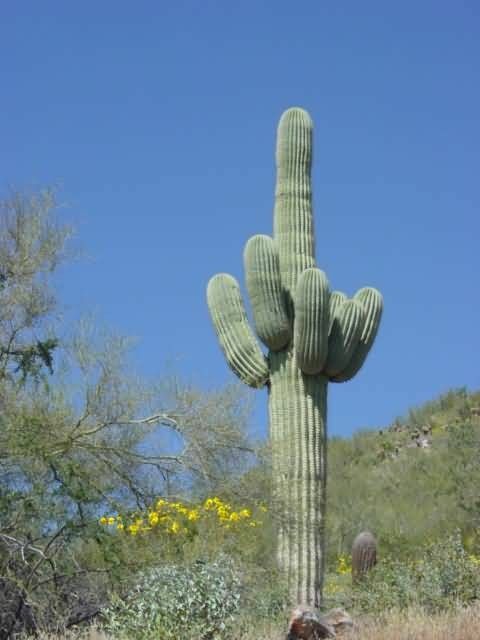 The saguaro is a tree like cactus species which can grow to be over 20 m tall. The saguaro blossom is the state wildflower of Arizona. Its scientific name is given in honor of Andrew Carnegie. Saguaros have a relatively long lifespan. They may grow their first side arm any time from 75-100 years of age but some never grow one at all. Saguaros soak up the rainwater, Whenever it rains.